"Hey, you have glitter on your *insert random part of my body* "
"At this point of my life? I am not surprised." You would never guess how many times during the past weeks I've be part of this little dialogue with random people. So it's about time to say hi everyone, my name is Barbara and I use glitter. People say: Glitter is the STD of arts and crafts. I say: Totally worth it! Because everything looks better covered in it. Literally anything. If you don't believe me you obviously haven't seen my 'Glitter' Pinterest board. I am drown to sparkly things in a way that's almost funny. One time, a colleague with glittery nails was telling me something and I did not hear a thing, in my head I kept repeating 'Woah sparkly!'. That's the level I am talking about. The other day I went on a shopping spree and what I am most excited about is a glittery phone case. $7 from K-Mart, because I'm so fancy. There were also French macarons during said shopping day and they come close second. And you know how much I love French Macarons! So, there comes a time in your life when you notice you accumulated a lifetime supply of glitter nail polish, and when your highlight is more on fleek than your eyebrows you know there's only one thing left to do: sprinkle glitter in your hair. 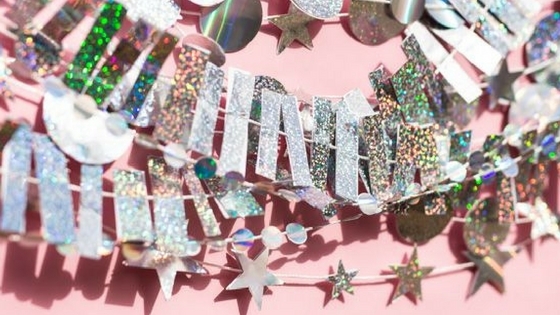 Because who said glitter can only be used for fail DIY Pinterest projects? I use the term 'sprinkle glitter' very loosely. What really happens is that you mix a ton of glitter with some hair gel and guess your way following your hair parting. Will it end all over your hands? Yes. Will it end on the floor? Yes, yes it will. Will it go away by combing? Let's say you may not see any sparkle in your hair after brushing it, but it doesn't mean you will find glitter everywhere in the room you brushed your hair in. And upon a closer look also on your scalp. Which is not a bad thing. After all, you did go to the extent to add sparkle to your life. Just relax and go with it, being aware that everything will be covered in glitter. Seriously, you will find glitter in your bra. Glitter is a lifestyle choice just as much as, let's say, being vegan, if not more. Firstly, you don't need to tell everyone, they will see the glitter from miles away without you mentioning it. Also, has any vegan person convinced their friends to join their diet? Didn't think so. But ask my friends and colleagues if they found glitter in the most random places after seeing me, and the answer will be yes. Now that I think about it, glitter really is like an STD. As in, you will find it in your pants, and you weren't the one with glitter roots! Do you really think your friends suit you?